FineArt Baryta – a bright white, 100% a -cellulose paper – guarantees archival standards. 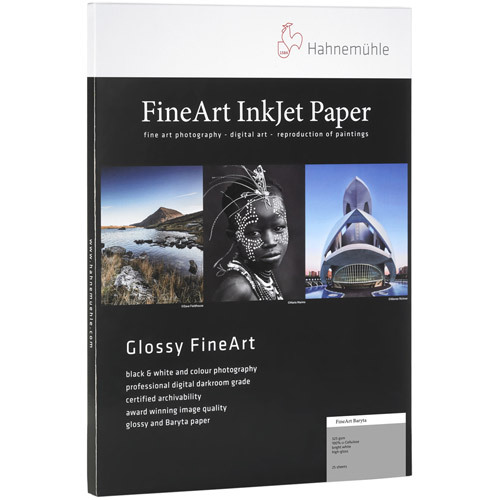 With its premium high-gloss baryta inkjet coating FineArt Baryta meets the highest industry standards regarding density, colour gamut, colour graduation and image sharpness while preserving the special touch and feel of genuine art paper. Compatible with pigmented and dye inkjet systems. Photographic and fine art reproduction complying with highest archival standards, digital art, black & white and colour photography, limited edition prints, presentation prints for display purposes and exhibitions, albums, greeting cards etc.